The Accufast ET tabber is a side tabber that can be used in almost any and all tabbing applications. 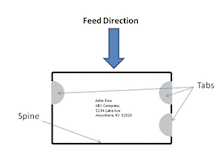 The Accufast ET tabber can tab self mailers and booklets with the appropriate tabs in the correct spots automatically. The set up and operation of the tabber is very easy and requires little interaction. Just select the correct Tab Mode, make sure the proper tabs are loaded, and then feed from your favorite feeding device or finishing system. When you pair the Accufast ET tabber with the HDF Feeder and 3FV conveyor, you have the most versatile tabbing system out there today. All ACCUFAST tabbing machines for sale are proudly made in the USA. The ACCUFAST ET tabbing machine is the next generation of table top tabber. The Accufast ET tabber is designed to handle everything a mailer throws at it, from edge tabbing or top tabbing of self mailers to the specialty tabs needed to meet booklet requirements. The USPS defines a booklet as a folded mailer with a spine and some sort of device (staple or glue) to close the spine. The regulations require at least 2 and usually 3 one and a half inch tabs to close the booklet for self mailing. The specification for the location of the tabs is quite precise. Booklet tabbing is most often an off line activity. Typically a feeder such as the ACCUFAST FX or ACCUFAST HDF is used in-line with the ET and the booklets are fed spine first into the tabber. Tabs are applied based on the tab mode selected at the start of the run. 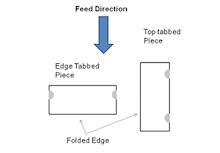 The location of the tabs is automatically set based on the size of the piece being used and USPS specification. Because a self mailer often starts out as a single sheet of paper, the Accufast ET tabber can easily become part of a mail production system that can include a paper folder, the Accufast ET tabbing machine, a transfer table and an ink jet address printer. All of these modules are available from Walz. its outstanding feature is its ability to run both 1 and 1.5 inch tabs at the flick of a switch, meeting USPS specs.